The U.S. state, which hasn’t even set a budget, sold $550 mln of bonds on Thursday at a slightly higher yield premium than it paid in January. It’s not enough of a financial penalty to force reforms, but it’s a hint of the danger that bickering politicians are courting. 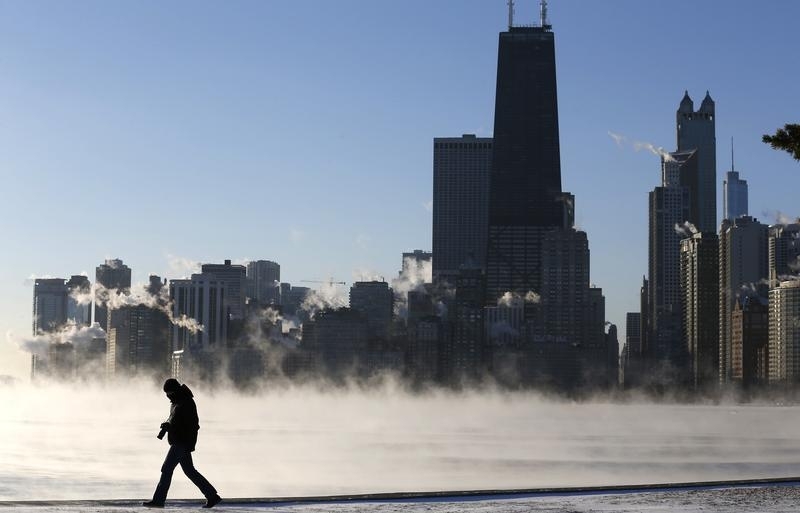 A man is silhouetted against the arctic sea smoke rising off Lake Michigan in Chicago, Illinois January 6, 2014. The U.S. state of Illinois on June 16 priced $550 million of new general obligation bonds, with 10-year bonds yielding 185 basis points above Municipal Market Data’s benchmark yield for municipal debt. Bank of America Merrill Lynch won the deal in competitive bidding. The spread on Illinois debt was 175 basis points before the sale, according to MMD, a unit of Thomson Reuters. Illinois in January sold $480 million of GO bonds with 10-year yields at 154 basis points above MMD’s AAA benchmark. Standard & Poor’s dropped Illinois’ general obligation bond rating by one notch to BBB-plus with a negative outlook on June 9, citing the state’s weakened finances. That followed a downgrade of Illinois’ rating to Baa2, just two steps above junk, by Moody’s Investors Service on June 8.